Outstanding setting at heart of the Les Baronnies Provençales Regional Nature park, facing the Mont Ventoux. Marie and Marc welcome you to this hundred-year-old sheep barn, sympathetically converted to retain its charming traditional features. 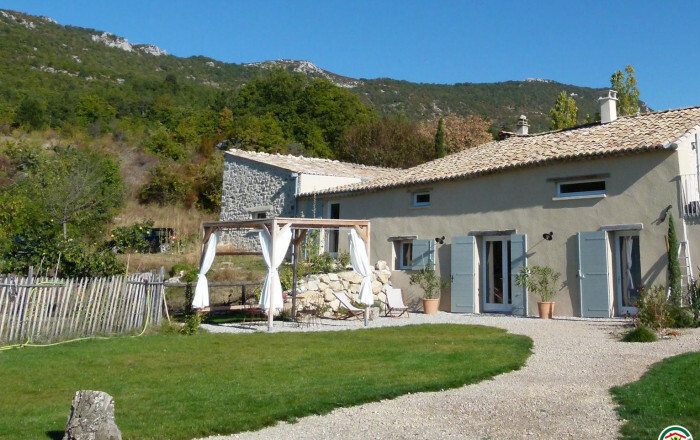 Wonderful panoramic views of the Drôme Provençale mountains. Ground floor gîte, adjoining another, with separate entrance. Large living room (sofa bed, inset fireplace) with open-plan fitted kitchen, bedroom (double bed), large shower room. West facing garden, perfect for admiring the sunset. Swimming pool (10x4.5m) shared with gîte Sud. Cot, high chair possible (ask owners).